If you are going to be debating at the Coolidge Cup, it will help you to know that the Coolidge Foundation has a distinctive approach to debate. Two important things for you to know about are our debate format and our debate style. One of the goals of the Coolidge Cup is to bring together top debaters from various formats to compete against each other in a unique format that we refer to as the Coolidge Cup Format. At the Coolidge Cup, you’ll compete against a wide variety of debaters, including Lincoln-Douglas debaters, Public Forum debaters, and speakers from Policy, Congressional, and other formats. At the Coolidge Cup, students debate individually, and the timing and order of speeches is as described below. Please familiarize yourself with it, as it likely differs from other formats that you have participated in throughout your debate career. Debaters should not raise new arguments during rebuttals. Both sides will receive 5 minutes of prep time which can be used when desired between speeches. One thing to draw your attention to is that, unlike many other formats, in this format the negative side gets the last speech. While speaking style is important, to be crowned a Coolidge Debate champion, content expertise is most important. Debaters will be judged carefully based on the quality of their arguments and evidence. Debaters should take extreme care to ensure they understand the arguments they are making, and that their evidence comes from reliable, trusted sources. Primary sources, facts and figures from government-published databases, scholarly research, academic articles, books, and other publications are examples of high-quality evidence. Choose the major points that you want to make, and make them clearly. Take the time to define key terms, provide vivid examples, or cite evidence that back your claims. Particularly with constructive speeches, it is better to lay out three to five good points than to make ten or more weak or unsupported points. “Dropped points,” i.e. failing to counter a point made by the other side, is not necessarily disqualifying in a Coolidge Debate (though pointing out the flaws in opponents’ arguments is important to success). President Coolidge, a great economizer of words, would want to know what your main ideas are; he would not be moved by superfluous ones. Relevant arguments are important at the Coolidge Cup. With that in mind, the Coolidge Foundation creates a debate brief that outlines important and evidence-based arguments for both sides of the resolution. The brief also includes a section with background on the topic and definitions of key terms. Arguments from outside the brief are both permitted and encouraged, but debaters should carefully evaluate the logic of the arguments that they use. Quality evidence is also important at the Coolidge Cup. Evidence from outside the brief is permitted and encouraged, but debaters should carefully evaluate the evidence that they use, and only use evidence that they genuinely believe is good and reliable. 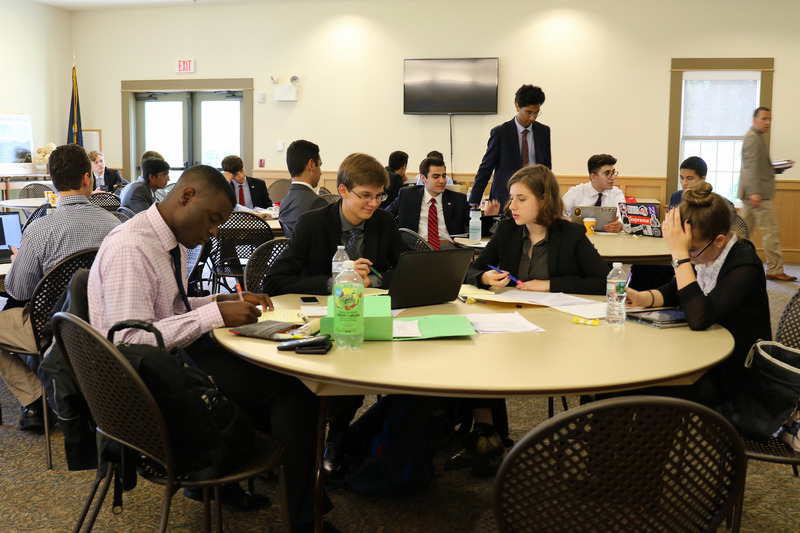 You may ask your opponent about the evidence that he or she is using, but unlike standard high school policy debate, the Coolidge Cup does not expect debaters to prepare evidence cards and “call” for them during the debate. Also, debaters are not allowed to use visual aids such as posters, handouts, or printed graphs. If there is a graph or diagram that you’d like to incorporate into your argument, practice describing it in words. Good, realistic debate requires an openness to free expression. The Coolidge Foundation is committed to protecting such expression. At the Coolidge Cup, you may encounter individuals from a variety of backgrounds with a broad range of perspectives. It is expected that all Coolidge Cup participants will maintain a high level of civility. If you hear an idea with which you disagree–whether in a round, in between rounds, during a presentation, or in some other context–it is expected that you will engage at the level of ideas, not at a personal level. Attempts to prevent another person from expressing an idea by shouting them down, or through some other such method, will not be tolerated.